In our very wide offer of our firm there an be found the furniture for individual order to houses, flats, firms and institutions. We are also direct distributor of household appliances. We have large experience, which allows us efficient cooperation with our clients on every stage of an order from the meeting till the esthetic assembly. We are flexible and creative, we are able to fit our offer to demands of our clients so they can be satisfied from functionality and right deployment of each centimeter. We make Your dreams come true of beautiful and harmonious interior by using materials, which have the highest quality and have been proven. That make our realizations to be durable and they preserve the highest visual and usable quality even after long time of using them. In KADA MEBLE we believe, that fashion must go together with functionality and thanks to that our customers receive professional service and advice. 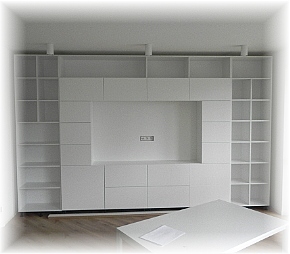 Furniture is our passion, that’s why the attention to details makes quality of our services the most important to us. We guarantee thoroughness, punctuality and professional service.